Denali National Park Five Ounce Silver Bullion Coins are now being sold by the United States Mint. 5,200 were initially ordered by the Mint’s network of authorized purchasers (APs), according to the bureau’s reported sales figures on Monday, October 22, 2012. Another 300 sold during the following day. Denali bullion coins depict the park located in Alaska, and mark the final issue this year in the America the Beautiful Five Ounce Silver Bullion Coins™ series. They follow previous 2012-dated coins honoring El Yunque National Forest in Puerto Rico, Chaco Culture National Historical Park in New Mexico, Acadia National Park in Maine, and Hawai’i Volcanoes National Park on the Big Island of Hawaii. For comparison purposes, the Denali tally of 5,200 lands in the middle of the pack for debut sales of 2012-dated coins. The Hawai’i Volcanoes bullion coin issued last month had opening sales of 7,900. Both of those numbers are up significantly from 3,200 starting sales of the Chaco Culture bullion coin. They are, however, down from the Acadia National Park bullion coin that debuted in July and saw initial orders of 9,900. ATB silver coins are struck from five ounces of .999 fine silver and feature the same basic designs as found on the associated America the Beautiful Quarters®. Like those quarters, five new coins are issued annually, each featuring a different reverse design emblematic of a selected site of national interest from around the United States and its territories. The programs debuted in 2010 and are scheduled to run through 2021. A series of numismatic five ounces coins are also produced by the U.S. Mint for collectors known as the America the Beautiful Five Ounce Silver Uncirculated Coins™. The uncirculated coins are almost identical to the bullion coins with the exception of a difference in their finish and a ‘P’ mint mark on the uncirculated coins denoting their production at the Philadelphia Mint. Eight different America the Beautiful Five Ounce Silver Bullion Coins are currently offered by the U.S. Mint to its authorized purchasers. The chart below offers their most recent sales figures, as of Tuesday, October 23, 2012. 2012 America the Beautiful bullion coins are struck to meet demand. Unlike releases from the previous two years, no pre-determined mintage cap is in place. For reference, the maximum mintage for the 2011 bullion coins is set at 126,700. 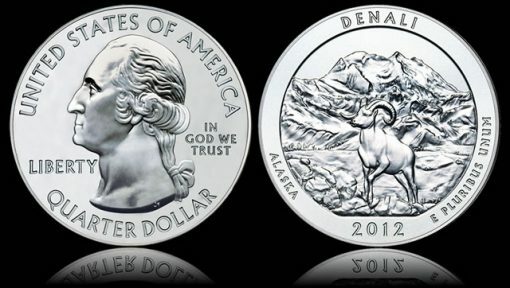 Designs found on the Denali National Park Silver Bullion Coin are identical to those found on the Denali National Park Quarter, which is scheduled to enter circulation on November 5, 2012. This includes the obverse portrait of George Washington as originally completed by John Flanagan for use on the 1932 circulating quarter dollar. The reverse of the coin contains a design emblematic of Denali National Park located in the state of Alaska. The design depicts a Dall sheep in the foreground with Mount McKinley rising in the background. Reverse inscriptions include DENALI, ALASKA, 2012 and E PLURIBUS UNUM. Unique to the five ounce coins, an edge inscription indicates the coins’ weight and fineness with ".999 FINE SILVER 5.0 OUNCE." The United States Mint uses a network of authorized purchasers for distribution of all of its bullion products. The APs obtain the coins in bulk from the Mint, then resell them in smaller quantities for a small premium above the current spot price of the silver contained within them. Investors and collectors will find the coins for sale at a number of coin and bullion dealers.